When my son was 2 years old we asked him what he would like to be for Halloween. He replied, “a monster…” And we smiled. Then he added “…truck.” And we just stood there staring at each other. My wife decided that creating this particular costume concept would be delegated to me. 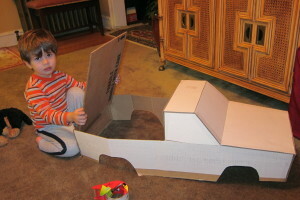 So over the next week, my little helper and I created a monster truck from paper, salvaged cardboard, and foam shipping materials. Finally we skinned it with artwork largely adapted from a free, printable project from HP. It was meant to be a small paper toy I think. 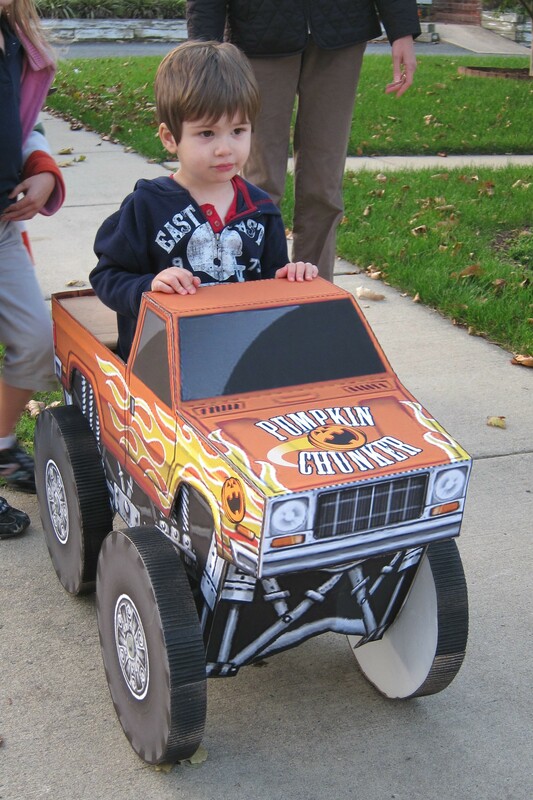 Anyway, we made the truck so that it could be used as a costume or as a big toy truck once Halloween was over. The truck bed hinges open and closed. So many stuffed animals got rides all around the house for quite a while. Looking back, this may have set the “ambitious” bar a little high for paper costumes at an early age. He thinks that I can make anything now. Now my son is 6 years old and he wanted to be a very specific Transformer for Halloween. “Soundwave” is a robot who occasionally becomes a boombox (in case you weren’t aware of that critical information.) As such, the character has a cassette door on the front of his chest. My son wanted that to be a functional part of the costume. He would eject the door latch and people would eagerly hurl candy into the open built-in chamber. There is a magnetic closure on the door so that he can easily operate it with gloves on. I added a little light & sound module because – just because. Kids love that kind of stuff. The sound is the same sound that the robot makes when he transforms. Thanks, Ann! Yeah, he’s a lot of fun to work with. OMG, Rob – if only I’d apply that dedication to my own costumes! Well, I can only say that you bring it upon yourself. OMG Rob – I wish I could put that much dedication into my own costumes. Well, I can only say you bring it upon yourself! Hey Rob, I’m admiring your creations. Great stuff! Thanks for your note! I get asked this question quite a bit. In fact, I was just discussing creating a tutorial and template last week in order to help anyone who wants to make something like this. In the meantime, I’ll share the original reference I used for inspiration below. You’d need some cardboard & shipping tape for the basic structure and I’d recommend looking closely at the photos on my post to better see how I scaled it up and constructed it. 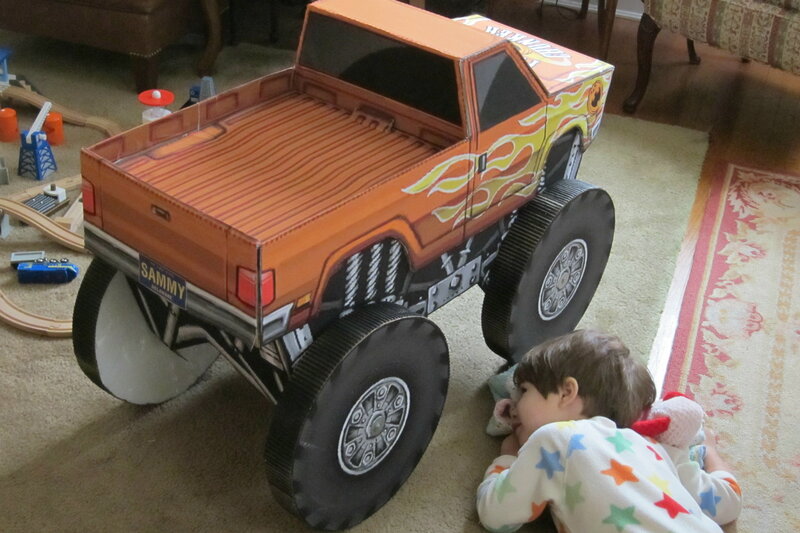 Very best of luck to you and please send photos if you do make a cardboard truck costume! I should have noted it is the Transformer costume that we are attempting! Thanks! !